Combine the water, evaporated milk and fresh milk, and heat in the microwave for maximum 30 seconds (the liquid should be lukewarm, not hot). Transfer the liquid mixture into a large bowl. Add the remaining ingredients (except the breadcrumbs) in the order they are listed. Mix with a dough mixer for about 15-20 minutes. Transfer dough into a bowl lightly brushed with oil. Cover with a damp clean cloth, or lightly oiled cling film. Set aside in a warm, draft-free place (alternatively, in a 50°C pre-heated oven) until double in size. When the dough is ready, portion into balls about 4 cm in diameter. Roll in the breadcrumbs and place on baking trays lined with baking paper. Cover and leave to rise in a warm place until double in size. Lastly, bake in a pre-heated oven at 190°C (375°F) for 10-15 minutes. How I really miss filipino food and thank you for sharing this article. 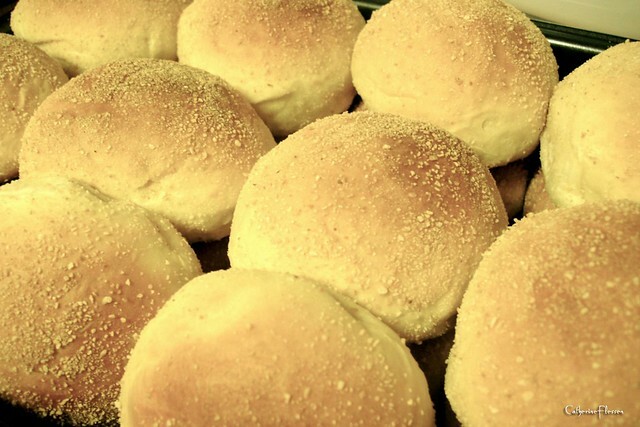 I will find time to make Pandesal this weekend.